Mexican muralism was the promotion of mural painting starting in the 1920s, generally with social and political messages as part of efforts to reunify the country under the post Mexican Revolution government. It was headed by “the big three” painters, Diego Rivera, José Clemente Orozco and David Alfaro Siqueiros. From the 1920s to about 1970s a large number of murals with nationalistic, social and political messages were created on public buildings, starting a tradition which continues to this day in Mexico and has had impact in other parts of the Americas, including the United States where it served as inspiration for the Chicano art movement. Mexico has had a tradition of painting murals, starting with the Olmec civilization in the pre Hispanic period and into the colonial period, with murals mostly painted to evangelize and reinforce Christian doctrine. The modern tradition has its roots in the 19th century, with this use of political and social themes. The first Mexican mural painter to use philosophical themes in his work was Juan Cordero in the mid 19th century. Although he did mostly work with religious themes such as the cupola of the Santa Teresa Church and other churches, he painted a secular mural at the request of Gabino Barreda at the Escuela Nacional Preparatoria (since disappeared). The latter 19th century was dominated politically by the Porfirio Díaz regime. This government was the first to push for the cultural development of the country, supporting the Academy of San Carlos and sending promising artists abroad to study. However, this effort left out indigenous culture and people, with the aim of making Mexico like Europe. Gerardo Murillo, also known as Dr. Atl, is considered to be the first modern Mexican muralists with the idea that Mexican art should reflect Mexican life. Academy training and the government had only promoted imitations of European art. Atl and other early muralists pressured the Diaz government to allow them to paint on building walls to escape this formalism. Atl also organized an independent exhibition of native Mexican artists promoting many indigenous and national themes along with color schemes that would later appear in mural painting. The first modern Mexican mural, painted by Atl, was a series of female nudes using “Atlcolor” a substance Atl invented himself, very shortly before the beginning of the Mexican Revolution . Another influence on the young artists of the late Porfirian period was the graphic work of José Guadalupe Posada, who mocked European styles and created cartoons with social and political criticism. The Mexican Revolution itself was the culmination of political and social opposition to Porfirio Díaz policies. One important oppositional group was a small intellectual community that included Antonio Curo, Alfonso Reyes and José Vasconcelos. They promoted a populist philosophy that coincided with the social and political criticism of Atl and Posada and influenced the next generation of painters such as Diego Rivera, José Clemente Orozco and David Alfaro Siqueiros. These ideas gained power as a result of the Mexican Revolution, which overthrew the Díaz regime in less than a year. However, there was nearly a decade of fighting among the various factions vying for power. Governments changed frequently with a number of assassinations, including that of Francisco I. Madero who initiated the struggle. It ended in the early 1920s with one-party rule in the hands of the Álvaro Obregón faction, which became the Partido Revolucionario Institucional (PRI). During the Revolution, Atl supported the Carranza faction and promoted the work of Rivera, Orozco and Siqueiros, who would later be the founders of the muralism movement. Through the war and until 1921, Atl continued to paint murals among other activities including teaching the Mexico’s next generation of artists and muralists. Eagle and snake image from the Colegio San Ildefonso project by Jean Charlot. In 1921, after the end of the military phase of the Revolution, José Vasconcelos was appointed to head the Secretaría de Educación Pública. At the time, most of the Mexican population was illiterate and the government needed a way to promote the ideals of the Mexican Revolution. It was Vasconcelos’s idea have a government-backed mural program for this purpose. 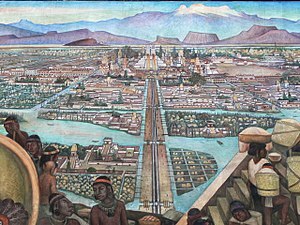 Similar to mural use in the pre Hispanic period and during the colonial period, the purpose of these murals were not simply aesthetic, but social, to promote certain ideals. These ideals or principles were to glorify the Mexican Revolution and the identity of Mexico as a mestizo nation, with the indigenous promoted as well as the Spanish. The government began to hire the country’s best artists to paint murals, calling some of them home from Europe including Diego Rivera. These initial muralists included Dr. Atl, Ramón Alva de la Canal, Federico Cantú and others but the main three would be David Alfaro Siqueiros, José Clemente Orozco and Diego Rivera. His time as secretary was short but it set how muralism would develop. His image was painted on a tempera mural in 1921 by Roberto Montenegro, but this was short lived. His successor at the Secretaría de Educación Pública ordered it painted out. The muralists differed in style and temperament, but all believed that art was for the education and betterment of the people. This was behind their acceptance of these commissions as well as their creation of the Syndicate of Technical Workers, Painters, and Sculptors. Mural in the Palacio de Bellas Artes by Rufino Tamayo. The first government sponsored mural project was on the three levels of interior walls of the old Jesuit institution Colegio San Ildefonso, at that time used for the Escuela Nacional Preparatoria. However, most of the murals in the Escuela National Preparatoria were done by José Clemente Orozco with themes of a mestizo Mexico, the ideas of renovation and the tragedies of the Revolution; Fernando Leal painted ["dancers of Chalma"] "Los danzantes de Chalma", no earlier than 1922. Opposite that mural, Jean Charlot painted La conquista de Tenochtitlán (Conquest of Tenochtitlan) by Jean Charlot—invited by Leal. This project at the institution was followed by projects at the Palacio Nacional, the interior walls of the Palacio de Bellas Artes, the Escuela Nacional de Chapingo the Escuela Nacional de Medicina and the Secretaria de Educación Pública building among many others. The movement was strongest from the 1920s to the 1950s, which corresponded to the country’s transformation from a mostly rural and mostly illiterate society to an industrialized one. While today they are part of Mexico’s identity, at the time they were controversial, especially those with socialist messages plastered on centuries-old colonial buildings. One of the basic underpinnings of the nascence of a post revolutionary Mexican art was that it should be public, available to the citizenry and above all not the province of a few wealthy collectors. The great societal upheaval made the concept possible as well as a lack of relatively wealthy middle class to support the arts. On this, the painters and the government agreed. One other point of agreement was that artists should have complete freedom of expression. This would lead to another element added to the murals over their development. In addition to the original ideas of a reconstructed Mexico and the elevation of Mexico’s indigenous and rural identity, many of the muralists, including the three main painters, also included elements of Marxism, especially the struggle of the working class against oppression. The inception and early years of Mexico's muralist movement are often considered the most ideologically pure and untainted by contradictions between socialist ideals and government manipulation. This initial phase is referred to as the "heroic" phase while the period after 1930 is the "statist" phase with the transition to the latter phase caused by José Vasconcelos's resignation in 1924. Scholar Mary Coffey describes those who "acknowledge a change but refrain from judgment about its consequences" as taking the soft line and those who see all murals after 1930 as "propaganda for a corrupt state" as taking a hard line. Another stance is that the evolution of Mexican muralism as having an uncomplicated relationship with the government and as an accurate reflection of avant-garde and proletariat sentiments. However, hard liners see the movement as complicit in the corrupt government's power consolidation under the guise of a socialist regime. Art historian Leonard Folgarait has a slightly different view. He marks 1940 as the end of the post-revolutionary period in Mexico as well as the renaissance era of the muralist movement. The conclusion of the Lázaro Cárdenas administration (1934 – 1940) and the beginning of the Manuel Avila Camacho (1940 – 1946) administration saw the rise of an ultraconservative Mexico. The country’s policy was aimed at maintaining and strengthening a capitalist society. Mural artists like the Big Three spent the post-revolutionary period developing their work based on the promises of a better future, and with the advent of conservatism they lost their subject and their voice. The Mexican government began to distance itself from mural projects and mural production became relatively privatized. This privatization was a result of patronage from the growing national bourgeoisie. Murals were increasingly contracted for theaters, banks, and hotels. Mexican populist art production from the 1920s to the 1950s is often grouped under the name of “Escuela Mexicana de Pintura (y Escultura) (Mexican School of Painting and Sculpture), coined in the 1930s by art historians and critics. The term is not well-defined as it does not distinguish among some important stylistic and thematic difference, there is no firm agreement which artists belong to it nor if muralism should be considered part of it or separate. It is not a school in the classic sense of the word as it includes work by more than one generation and with different styles that sometimes clash. However, it does involve a number of important characteristics. Mexican School mural painting was a combination of public ideals and artistic aesthetics “positioned as a constituent of the official public sphere.”  Three formal components of official Mexican muralism are defined as: 1) Direct participation in official publicity and discourse 2) Reciprocal integration of the visual discourse of the mural to an array of communicative practices participant in defining official publicity (including a variety of scriptural genres, but also public speech, debate and provocative public “event”) 3) The development and public thematizing of a social-realist aesthetic (albeit multiform in character) as the visual register for the public sense of the mural work and as the doxic, or unquestioned, limits for public dispute over the representational space of the mural image Most painters in this school worked in Mexico City or other cities in Mexico, working almost uninterrupted on projects and/or as teachers, generally with support of the government. Most were concerned with the history and identity of Mexico and politically active. Most art from this school was not created for direct sale but rather for diffusion in both Mexico and abroad. Most were formally trained, often studying in Europe and/or in the Academy of San Carlos. Mural by Alfredo Zalce at the state government palace in Morelia. A large quantity of murals were produced in most of the country from the 1920s to 1970, generally with themes related to politics and nationalism focused often on the Mexican Revolution, mestizo identity and Mesoamerican cultural history. These served as a form of cohesion among members of the movement. The political and nationalistic aspects had little directly to do with the Mexican Revolution, especially in the later decades. The goal was more to glorify it and its results as a means to legitimatize the post Revolution government. The other political orientation was that of Marxism, especially class struggle. This was strongest in the early movement with Rivera, Orozco and Siqueiros all avowed communists. The political messages became less radical but they remained firmly to the left. Much of the mural production glorified the indigenous aspect of Mexican culture, considering it an important factor in the creation of modern Mexico. This was added with the idea of reexamining the country’s history from a different perspective. One other aspect that most of the muralists shared was a rejection of the idea that art was only for the elite, but rather as a benefit for the masses. The murals took on monumental status because of where they were situated, mostly on the walls of colonial era government buildings and the themes that were painted. The mural painters of Mexico freely shared ideas and techniques as they were a closely knit group. However, the work of each was distinctive as the government did not set style and artists can generally be deduced without looking at signatures. Techniques included the revival of old techniques such as the fresco, painting on freshly plastered walls and encaustic or hot wax painting . Others used mosaics and high fire ceramics, as well as metal parts, and layers of cement. The most innovative of the artists was Siqueiros who worked with pyroxlene, a commercial enamel and Duco (used to paint cars), resins, asbestos, old machinery and was one of the first to use airbrush for artistic purposes. He pored, sprayed, dripped and splattered paint for the effects they created haphazardly. By far, the three most influential muralists from the 20th century are Diego Rivera, José Clemente Orozco, and David Siqueiros, called “los tres grandes” (the three great ones). All believed that art was the highest form of human expression and a key force in social revolution. Their work defined the movement taking over from Vasconcelos. It created a mythology around the Mexican Revolution and the Mexican people which is still influential to this day, as well as promote Marxist ideals. At the time the works were painted, they also served as a form of catharsis over what the country had endured during the war. However, the three were different in their artistic expression. Rivera’s works were utopian and idealist, Orozco’s were critical and pessimistic and the most radical were those of Siqueiros, heavily focused on a scientific future. The differences among the three have much to do with how each experienced the Mexican Revolution. Rivera was in Europe the entire time and did not fight. He never depicted the horrors of the war but what he perceived to be the social benefits from it. The other two did and both did express the horrors of war in their work. There was resentment to Rivera by the other two because of it, especially from Siqueiros. Of the three, Rivera was the most traditional in terms of painting styles, drawing heavily from European modernism. In his narrative mural images, Rivera incorporated elements of cubism His themes were Mexican, often scenes of everyday life and images of ancient Mexico. He originally painted this in bright colors in the European style but modified it to more earthy tones to imitate indigenous murals. His greatest contribution is the promotion of Mexico’s indigenous past into how many people both inside and outside of the country view it. Orozco also began with a European style of expression. However his art developed into an angry denunciation of oppression especially by those he considered to be an evil and brutal rules class. His work was somber and dire, with emphasis on human suffering and fear of the technology of the future. His work shows an "expressionist use of color, slashing lines, and parodic distortions of the human figure." Like most other muralists, Orozco condemned the Spanish as destroyers of indigenous culture, but he did have kinder depictions such as that of a Franciscan friar tending to an emaciated indigenous period. Unlike other artists, Orozco never glorified the Mexican Revolution, having fought in it, but rather depicted the horrors of this war. It caused many of his murals to be heavily criticized and even defaced. Siqueiros was the youngest and most radical of the three. He joined the Venustiano Carranza army when he was eighteen and experienced the Revolution from the front lines. Although all three muralists were communists, Siqueiros was the most dedicated, as evidenced by his portrayals of the proletarian masses. His work is also characterized with rapid, sweeping, bold lines and the use of modern enamels, machinery and other elements related to technology. His style showed a "futurist blurring of form and technique." His fascination with technology as it relates to art was exemplified when he emphasized the mass communications visual technology of photograph and motion picture in his eventual movement toward neorealism. His radical politics made him unwelcome in Mexico and the United States, so he did much of his work in South America. However, his masterpiece is considered to be the Polyforum Cultural Siqueiros, located in Mexico City. The Big Three struggled to express their leftist leanings after the initial years painting murals under government supervision. These struggles with the post-revolution government lead the muralists to create a union of artists and produce a radical manifesto. José Vasconcelos, the Secretary of Public Education under President Álvaro Obregón (1920–24) contracted Rivera, Siqueiros, and Orozco to pursue painting with the moral and financial support of the new post-revolutionary government. Vasconcelos, while seeking to promote nationalism and “raza cosmica,” seemed to contradict this sentiment as he guided the muralists to create works in a classic, European style. The murals became a target of Vasconcelos’s criticism when the Big Three departed from classical proportion and figure. Siqueiros was dissatisfied with the incongruity between the murals and the revolutionary concerns of the muralists, and he advocated discussion among the artists of their future works. 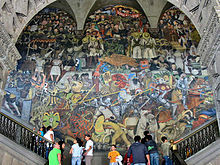 In 1922 the muralists founded the Union of Revolutionary Technical Workers, Painters, and Sculptors of Mexico. The Union then released a manifesto listing education, art of public utility, and beauty for all as the social goals of their future artistic endeavors. La Ciencia in Atlixco, Puebla by Jorge Figueroa Acosta. After nearly a century since the beginning of the movement, Mexican artists still produce murals and other forms of art with the same “mestizo” message. Murals can be found in government buildings, former churches and schools in nearly every part of the country. One recent example is a cross cultural project in 2009 to paint a mural in the municipal market of Teotitlán del Valle, a small town in the state of Oaxaca. High school and college students from Georgia, United States, collaborated with town authorities to design and paint a mural to promote nutrition, environmental protection, education and the preservation of Zapotec language and customs. Mural of Salvador Alvarado, former governor of Yucatan, displayed at the governor's palace, Merida (Yucatan), Mexico. Painted by Fernando Castro Pacheco. Mexican muralism brought mural painting back to the forefront of Western art in the 20th century with its influence spreading abroad, especially promoting the idea of mural painting as a form of promoting social and political ideas. It offered an alternative to non-representational abstraction after World War I with figurative works that reflect society and its immediate concerns. While most Mexican muralists had little desire to be part of the international art scene, their influence spread to other parts of the Americas. Notable muralists influenced by Mexican muralism include Carlos Mérida of Guatemala, Oswaldo Guayasamín of Ecuador and Candido Portinari of Brazil . Rivera, Orozco, and Siqueiros all spent time in the United States. Orozco was the first to paint murals in the late 1920s at Pomona College in Claremont, California, staying until 1934 and becoming popular with academic institutions. During the Great Depression, the Works Progress Administration employed artists to paint murals, which paved the way for Mexican muralists to find commissions in the country. Rivera lived in the United States from 1930 to 1934. During this time, he put on an influential show of his easel work at the Museum of Modern Art. The success of Orozco and Rivera prompted U.S. artists to study in Mexico and opened doors for many other Mexican artists to find work in the country. Siqueiros did not fare as well. He was exiled to the US from Mexico in 1932, moving to Los Angeles. During this time, he painted three murals, but they were painted over. The only one of the three to survive, América Tropical (full name: América Tropical: Oprimida y Destrozada por los Imperialismos, or Tropical America: Oppressed and Destroyed by Imperialism), was restored by the Getty Conservation Institute and the América Tropical Interpretive Center opened to provide public access. The concept of mural as political message was transplanted to the United States, especially in the former Mexican territory of the Southwest. It served as inspiration to the later Chicano muralism but the political messages are different. Revolutionary Nicaragua developed a tradition of muralism during the Sandinista period. Anreus, Robin Adèle Greeley, and Leonard Folgarait, eds. Mexican Muralism: A Critical History. Berkeley and Los Angeles: University of California Press 2012. Campbell, Bruce. Mexican Murals in Times of Crisis. Tucson: University of Arizona Press 2003. Charlot, Jean. The Mexican Mural Renaissance, 1920-1925. New Haven: Yale University Press 1967. Elliott, Ingrid. "Visual Arts: 1910-37, The Revolutionary Tradition." Encyclopedia of Mexico. Chicago: Fitzroy Dearborn 1997, pp. 1576-1584. Folgarait, Leonard. Mural Painting and Social Revolution in Mexico, 1920-1940. Cambridge: Cambridge University Press 1998. Good, Carl and John V. Waldron, eds. The Effects of the Nation: Mexican Art in an Age of Globalization. Philadelphia: Temple University Press 2001. Indych-López, Anna. Muralism Without Walls: Rivera, Orozco, and Siqueiros in the United States, 1927-1940. Pittsburgh: University of Pittsburgh Press 2009. Jaimes, Héctor. Filosofía del muralismo mexicano: Orozco, Rivera y Siqueiros. México: Plaza y Valdés, 2012. Lee, Anthony. Painting on the Left: Diego Rivera, Radical Politics, and San Francisco's Public Murals. Berkeley and Los Angeles: University of California Press 1999. Rivera, Diego, and Wolfe, Bertram David. Portrait of Mexico: Paintings by Diego Rivera and text by Bertram D. Wolfe. New York: Covici, Friede, 1937. Rodríguez, Antonio. A History of Mexican Mural Painting. London: Thames & Hudson 1969. Rochfort, Desmond.Mexican Muralists. San Francisco: Chronicle Books 1993. Wechsler, James. "Beyond the Border: The Mexican Mural Movement's Reception in Soviet Russia and the United States." in Luis Martín Lozano, ed. Mexican Modern Art: 1900-1930. Ottawa: National Gallery of Canada 1999. ^ a b c d e f g h i j k l m n o p q r s t John Eugene Kenny (2006). The Chicano Mural movement of the Southwest: Populist public art and Chicano political activism (PhD). University of New Orleans. OCLC 3253092. ^ "Plasmó Juan Cordero primer mural en México con temas filosóficos" [Juan Cordero plastered the first mural with philosophical themes in Mexico]. NOTIMEX (in Spanish). Mexico City. May 27, 2008. ^ a b c d e f g "The art of Ramón Contreras and the Mexican Muralists movement" (PDF). San Bernardino County Museum. Retrieved June 27, 2012. ^ a b c d e f g h i j k l m n o p q r ) Luz Elena Mainero del Castillo (2012). "El muralismo y la Revolución Mexicana" [Muralism asn the Mexican Revolution] (in Spanish). Mexico: Instituto Nacional de Estudios Históricos de las Revoluciones de México. Archived from the original on May 14, 2012. Retrieved June 27, 2012. ^ a b c d e f g h i j "Populist art and the Mexican mural renaissance". Hispanic Heritage in the Americas -Latin American art. Britannica. Retrieved June 27, 2012. ^ a b Burton, Tony (March 14, 2008). "Dr. Atl and the revolution in Mexico's art". Mexconnect newsletter. ISSN 1028-9089. Retrieved June 27, 2012. ^ a b c d e f g h i j k Pomade, Rita (May 5, 2007). "Mexican muralists: the big three - Orozco, Rivera, Siqueiros". Mexconnect newsletter. ISSN 1028-9089. Retrieved June 27, 2012. ^ Folgariat, Leonard (1998). Mural painting and Social Revolution in Mexico 1920-1940. Cambridge: Cambridge University Press. pp. 42–46. ISBN 0-521-58147-8. ^ a b c Coffey, Mary (2002). "Muralism and The People: Culture, Popular Citizenship, and Government in Post-Revolutionary Mexico". The Communication Review. 5: 7–38. doi:10.1080/10714420212350. ^ a b c Leonard, Folgarait (1998). Mural Painting and Social Revolution in Mexico, 1920-1940: Art of the New Order. Cambridge University Press. p. 7. ^ Campbell, Bruce (2003). Mexican Murals in Times of Crisis. Tucson: The University of Arizona Press. p. 58. ^ James Oles (January 12, 2000). "Testigo de los anos 30" [Witness to the 1930s]. Reforma (in Spanish). Mexico City. p. 1. ^ a b "Escuela Mexicana de Pintura y Escultura" [Mexican School of Painting and Sculpting] (in Spanish). Mexico City: Artes e Historia magazine. Retrieved June 27, 2012. ^ a b Campbell, Bruce (2003). Mexican Murals in Times of Crisis. Tucson: University of Arizona Press. p. 55. ISBN 0-8165-2239-1. ^ a b c Campbell, Bruce (2003). Mexican Murals in Times of Crisis. Tucson: University of Arizona Press. p. 71. ISBN 0-8165-2239-1. ^ a b Cambell, Bruce (2003). Mexican Murals in Times of Crisis. Tucson: University of Arizona Press. p. 55. ISBN 0-8165-2239-1. ^ Richardson, William (1987). "The Dilemmas of a Communist Artist: Diego Rivera in Moscow, 1927-1928". Mexican Studies. 3 (1): 49–69. doi:10.2307/4617031. JSTOR 4617031. ^ Cambell, Bruce (2003). Mexican Murals in Times of Crisis. Tucson: University of Arizona Press. p. 48. ISBN 0-8165-2239-1. ^ a b Hubbard, Kathy (September 2010). "A CROSS-CULTURAL COLLABORATION: Using Visual Culture for the Creation of a Socially Relevant Mural in Mexico". Art Education. 63 (5): 68–75. ^ Del Barco, Mandalit. Revolutionary Mural To Return To L.A. After 80 Years. npr. October 26, 2010. Retrieved June 19, 2015. ^ Knight, Christopher. Art Review: 'America Tropical' transformed once more. Los Angeles Times. October 8, 2012. Retrieved June 19, 2015. ^ David Kunzle, The Murals of Revolutionary Nicaragua, 1979-1992. Berkeley and Los Angeles: University of California Press 1995. This page was last edited on 20 February 2019, at 01:08 (UTC).